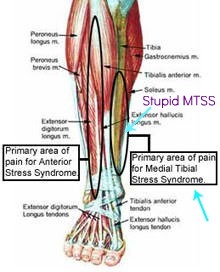 While there’s some hot spots along the area for Anterior Stress Syndrome that reminds me of my high school sports days, the bigger issue is MTSS. Basically if anyone were to touch where the arrow points, I couldn’t be held accountable for my actions. At a standstill it’s tender with occasional light throbbing. On impact I can feel it jarring and travel more towards my Tibia (do I get my PHD now?). This is the same pin point spot that I thought might be on the verge of stress fracture back in the spring. Interesting fact I just learned : shin splint pain is usually vertical where stress fracture pain is usually horizontal. Noted. Not giving enough recovery time during last little phase. In the past few weeks I’ve been running less around the reservoir (soft surface) and more on the road, whether it’s the central park loop (hello Harlem hills), east river or the side walk itself (worst offender). That alone means I should have been prepping my calves. While I’m still figuring out pacing and have some seriously slow moments, I’ve also been picking up the pace on some miles. Another major contributor to beating up my calves & shins. Should have seen it coming. Then add in hills? Yep, that’ll do it. I only did 2 or 3 runs with out compression sleeves and had no major issues but against the other factors add support would have been helpful. This problem should be avoidable now. I found my second pair of sleeves (under my bed of course) which are the newer and therefore tighter. I also just got a pair of Pro Compression socks for recovery. Stretching. Sigh. This may be one of the biggest reasons I should not run alone. So I don’t cop-out on stretching. I’m better than I use to be but I’m some one who needs to put some serious effort into stretching….in addition to yoga…right after my run. The key is to do it before I get back to my apartment. In Central Park, at the gym, hell on the sidewalk (like I don’t already). Ice. I actually have been icing my left shin the most. But I need to do it more. And all those little ice cups taking over my freezer door? They’re ready for some ice massage. Nightly. Ice door – check. Prepping ice cups – check. 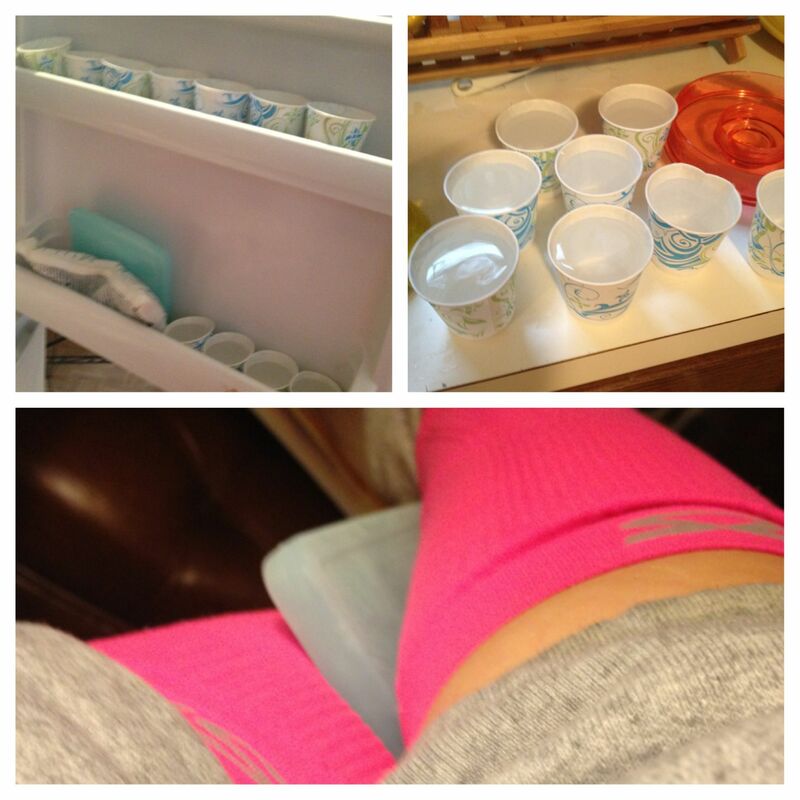 Ice pack (from a lunchbox), compression sleeves & sweatpants – check. Recovery. So shin splints are what kicked off the injury avalanche during my half marathon training. I ignored them. Then I thought I had a stress fracture. That was fun. I’m still not entirely convinced there wasn’t one to some degree. Meaning that I cut “recovery” pretty close. Part of me feels guilty & weak for cutting back lately, by now I’ve officially skipped 2 runs and 1 option one, especially as I was just starting to pick it up. But knowing what ignoring the pain does, I’m trying to remember the long-term goal here. I’m going to take it day by day. If a run can happen – great, my mind will be even more in the game (once you can’t have something…). If cardio cross-training needs to happen then ok. Maybe I’ll get serious on the bike. If neither of those are making me happy between my ankles and my knees then more yoga it is. There will also be some serious sticking and foam rolling. Have you ever battled with shin splints? Categories: Running | Tags: days off, injury, marathon training, NYC marathon, Pain, recovery, related links, running, shin splints, Tibia | Permalink.